All innovative ideas are inevitably associated with new language. Familiar words used in an unfamiliar context so that the language sounds ‘wacky’ to those in the current paradigm. Improvement science is no different. A problem arises when familiar words are used in a new context and therefore with a different meaning. Confusion. So we try to avoid this cognitive confusion by inventing new words, or by using foreign words that are ‘correct’ but unfamiliar. This use of novel and foreign language exposes us to another danger: the evolution of a clique of self-appointed experts who speak the new and ‘wacky’ language. This self-appointed expert clique can actually hinder change because it can result yet another us-and-them division. Another tribe. More discussion. More confusion. Less improvement. So it is important for an effective facilitator-of-improvement to define any new language using the language of the current paradigm. This can be achieved by sharing examples of new concepts and their language in familiar contexts and with familiar words, because we learn what words mean from their use-in-context. The word ‘capacity’ is familiar and we all know what we think it means. So when we link it to another familiar word, ‘demand’, then we feel comfortable that we understand what the phrase ‘demand-and-capacity’ means. The act of recognising a word is a use of memory or knowledge. Understanding what a word means requires more … it requires knowing the context in which the word is used. It means understanding the concept that the word is a label for. What sort of capacity are you referring to? [And if that is not the reaction then you may be talking to someone who has little understanding of flow science]. Then there are the foreign words that are used as new labels for old concepts. Lean zealots seem particularly fond of peppering their monologues with Japanese words that are meaningless to anyone else but other Lean zealots. Words like muda and muri and mura which are labels for important and useful flow science concepts … but the foreign name gives no clue as to what that essential concept is! muda means ‘waste’ and refers to the effects of poor process design in terms of the extra time (and cost) required for the process to achieve its intended purpose. A linked concept is a ‘niggle’ which is the negative emotional effect of a poor process design. muri means ‘overburdening’ and can be illustrated with an example. Suppose you work in a system where there is always a big backlog of work waiting to be done … a large queue of patients in the waiting room … a big heap of notes on the trolley. That ‘burden’ generates stress and leads to other risky behaviours such as rushing, corner-cutting, deflection and overspill. It is also an outcome of poor process design, so is avoidable. mura means variation or uncertainty. Again an example helps. Suppose we are running an emergency service then, by definition, a we have no idea what medical problem the next patient that comes through the door will present us with. It could be trivial or life-threatening. That is unplanned and expected variation and is part of the what we need our service to be designed to handle. 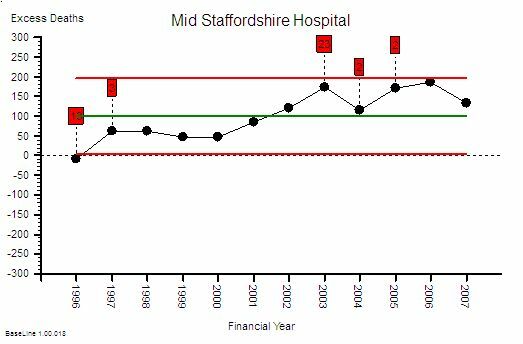 Suppose when we arrive for our shift that we have no idea how many staff will be available to do the work because people phone in sick at the last minute and there is no resilience on the staffing capacity. Our day could be calm-and-capable (and rewarding) or chaotic-and-incapable (and unrewarding). It is the stress of not knowing that creates the emotional and cultural damage, and is the expected outcome of incompetent process design. And is avoidable. And finally we come to words that are not foreign but are not very familiar either. This sounds like ‘practice’ but is not spelt the same. So is the the same? And it sounds like a medical condition called dyspraxia which means: poor coordination of movement. the practice and practical side of a profession or field of study, as opposed to theory. Ah ah! 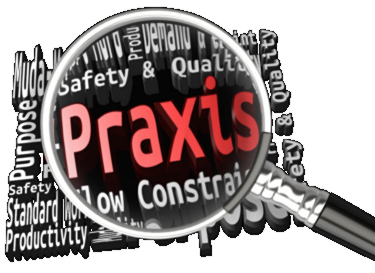 So praxis is a label for the the concept of ‘how to’ … and someone who has this ‘know how’ is called a practitioner. That makes sense. On deeper reflection we might then describe our poor collective process design capability as dyspraxic or uncoordinated. That feels about right too. An improvement science practitioner (ISP) is someone who knows the science of improvement; and can demonstrate their know-how in practice; and can explain the principles that underpin their praxis using the language of the learner. Without any wacky language. … and we could seek the wisdom of the growing Community of Healthcare Improvement Practitioners (CHIPs). FISH & CHIPs … a new use for a familiar phrase? Flow improvement-by-design requires being able to see the flows; and that is trickier than it first appears. We can see movement very easily. Seeing flows is not so easy – particularly when they are mixed-up and unsteady. One of the most useful tools for visualising flow was invented over 100 years ago by Henry Laurence Gantt (1861-1919). Henry Gantt was a mechanical engineer from Johns Hopkins University and an early associate of Frederick Taylor. Gantt parted ways with Taylor because he disagreed with the philosophy of Taylorism which was that workers should be instructed what to do by managers (=parent-child). Gantt saw that workers and managers could work together for mutual benefit of themselves and their companies (=adult-adult). At one point Gantt was invited to streamline the production of munitions for the war effort and his methods were so successful that the Ordinance Department was the most productive department of the armed forces. Gantt favoured democracy over autocracy and is quoted to have said “Our most serious trouble is incompetence in high places. The manager who has not earned his position and who is immune from responsibility will fail time and again, at the cost of the business and the workman“. Henry Gantt invented a number of different charts – not just the one used in project management which was actually invented 20 years earlier by Karol Adamieki and re-invented by Gantt. It become popularised when it was used in the Hoover Dam project management; but that was after Gantt’s death in 1919. The form of Gantt chart above is called a process template chart and it is designed to show the flow of tasks through a process. Each horizontal line is a task; each vertical column is an interval of time. 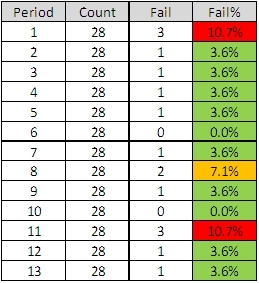 The colour code in each cell indicates what the task is doing and which resource the task is using during that time interval. Red indicates that the task is waiting. White means that the task is outside the scope of the chart (e.g. not yet arrived or already departed). The Gantt chart shows two “red wedges”. A red wedge that is getting wider from top to bottom is the pattern created by a flow constraint. A red wedge that is getting narrower from top to bottom is the pattern of a policy constraint. Both are signs of poor scheduling design. 1) Diagnosis – understanding how the current flow design is creating the queues and delays. 2) Design – inventing new design options. 3) Prognosis – testing the innovative designs so the ‘fittest’ can be chosen for implementation. These three steps are encapsulated in the third “M” of 6M Design® – the Model step. In this example the design flaw was the scheduling policy. When that was redesigned the outcome was zero-wait performance. No red on the chart at all. The same number of tasks were completed in the same with the same resources used. Just less waiting. Which means less space is needed to store the queue of waiting work (i.e. none in this case). That this is even possible comes as a big surprise to most people. It feels counter-intuitive. It is however an easy to demonstrate fact. Our intuition tricks us. 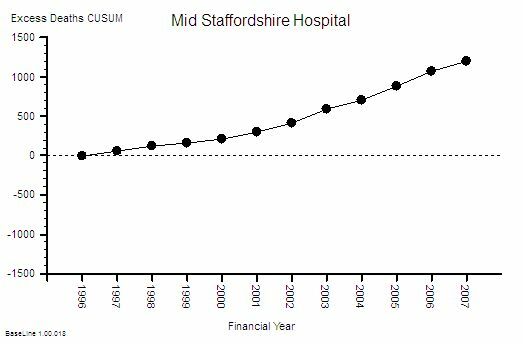 And that reduction in the size of the queue implies a big cost reduction when the work-in-progress is perishable and needs constant attention [such as patients lying on A&E trolleys and in hospital beds]. So what was the cost of re-designing this schedule? A pinch of humility. A few bits of squared paper and some coloured pens. A couple hours of time. And a one-off investment in learning how to do it. Peanuts in comparison with the recurring benefit gained. The phone announced the arrival of Leslie for the weekly ISP mentoring conversation with Bob. <Bob> Hi Leslie. What would you like to talk about today? <Leslie> A new challenge – one that I have not encountered before. <Bob>Excellent. As ever you have pricked my curiosity. Tell me more. <Leslie> OK. Up until very recently whenever I have demonstrated the results of our improvement work to individuals or groups the usual response has been “Yes, but“. The habitual discount as you call it. “Yes, but your service is simpler; Yes, but your budget is bigger; Yes, but your staff are less militant.” I have learned to expect it so I do not get angry any more. <Bob> OK. The mantra of the skeptics is to be expected and you have learned to stay calm and maintain respect. So what is the new challenge? <Leslie>There are two parts to it. Firstly, because the habitual discounting is such an effective barrier to diffusion of learning; our system has not changed; the performance is steadily deteriorating; the chaos is worsening and everything that is ‘obvious’ has been tried and has not worked. 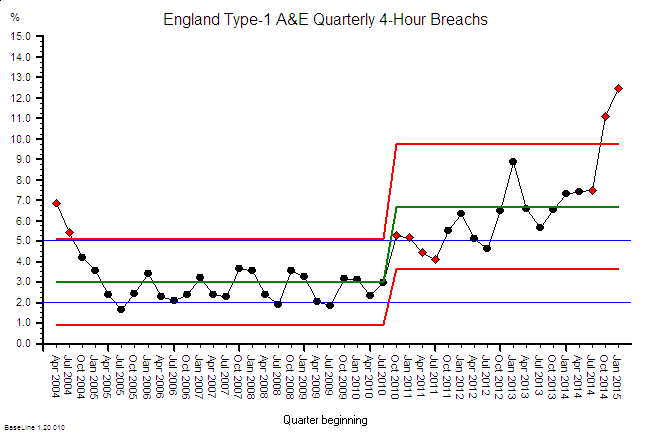 More red lights are flashing on the patient-harm dashboard and the Inspectors are on their way. There is an increasing turnover of staff at all levels – including Executive. There is an anguished call for “A return to compassion first” and “A search for new leaders” and “A cultural transformation“. <Bob> OK. It sounds like the tipping point of awareness has been reached, enough people now appreciate that their platform is burning and radical change of strategy is required to avoid the ship sinking and them all drowning. What is the second part? <Leslie> I say that I do not know because I do not have a diagnosis of the cause of the problem. I do know a lot of possible causes but I do not know which plausible ones are the actual ones. <Bob> That is a good answer. What was the response? <Bob>Ah ha. And how do you feel about that? <Leslie>I have learned the hard way to respect the opinion of skeptics. PDSA does work for me but not for them. And I do not understand why that is. I would like to conclude that they are not doing it right but that is just discounting them and I am wary of doing that. <Bob>OK. You are wise to be wary. We have reached what I call the Mirror-on-the-Wall moment. Let me ask what your understanding of the history of PDSA is? <Leslie>It was called Plan-Do-Check-Act by Walter Shewhart in the 1930’s and was presented as a form of the scientific method that could be applied on the factory floor to improving the quality of manufactured products. W Edwards Deming modified it to PDSA where the “Check” was changed to “Study”. Since then it has been the key tool in the improvement toolbox. <Bob>Good. That is an excellent summary. What the Zealots do not talk about are the limitations of their wonder-tool. Perhaps that is because they believe it has no limitations. Your experience would seem to suggest otherwise though. <Leslie>Spot on Bob. I have a nagging doubt that I am missing something here. And not just me. <Bob>The reason PDSA works for you is because you are using it for the purpose it was designed for: incremental improvement of small bits of the big system; the steps; the points where the streams cross the stages. You are using your FISH training to come up with change plans that will work because you understand the Physics of Flow better. You make wise improvement decisions. In fact you are using PDSA in two separate modes: discovery mode and delivery mode. In discovery mode we use the Study phase to build your competence – and we learn most when what happens is not what we expected. In delivery mode we use the Study phase to build our confidence – and that grows most when what happens is what we predicted. <Leslie>Yes, that makes sense. I see the two modes clearly now you have framed it that way – and I see that I am doing both at the same time, almost by second nature. <Bob>Yes – so when you demonstrate it you describe PDSA generically – not as two complimentary but contrasting modes. And by demonstrating success you omit to show that there are some design challenges that cannot be solved with either mode. That hidden gap attracts some of the “Yes, but” reactions. <Leslie>Do you mean the challenges that others are trying to solve and failing? <Bob>Yes. The commonest error is to discount the value of improvement science in general; so nothing is done and the inevitable crisis happens because the system design is increasingly unfit for the evolving needs. The toast is not just burned it is on fire and is now too late to use the discovery mode of PDSA because prompt and effective action is needed. So the delivery mode of PDSA is applied to a emergent, ill-understood crisis. The Plan is created using invalid assumptions and guesswork so it is fundamentally flawed and the Do then just makes the chaos worse. In the ensuing panic the Study and Act steps are skipped so all hope of learning is lost and and a vicious and damaging spiral of knee-jerk Plan-Do-Plan-Do follows. The chaos worsens, quality falls, safety falls, confidence falls, trust falls, expectation falls and depression and despair increase. <Leslie>That is exactly what is happening and why I feel powerless to help. What do I do? <Bob>The toughest bit is past. You have looked squarely in the mirror and can now see harsh reality rather than hasty rhetoric. Now you can look out of the window with different eyes. And you are now looking for a real-world example of where complex problems are solved effectively and efficiently. Can you think of one? <Leslie>Well medicine is one that jumps to mind. Solving a complex, emergent clinical problems requires a clear diagnosis and prompt and effective action to stabilise the patient and then to cure the underlying cause: the disease. <Bob>An excellent example. Can you describe what happens as a PDSA sequence? <Leslie>That is a really interesting question. I can say for starters that it does not start with P – we have learned are not to have a preconceived idea of what to do at the start because it badly distorts our clinical judgement. The first thing we do is assess the patient to see how sick and unstable they are – we use the Vital Signs. So that means that we decide to Act first and our first action is to Study the patient. <Bob>OK – what happens next? <Leslie>Then we will do whatever is needed to stabilise the patient based on what we have observed – it is called resuscitation – and only then we can plan how we will establish the diagnosis; the root cause of the crisis. <Bob> So what does that spell? <Leslie> A-S-D-P. It is the exact opposite of P-D-S-A … the mirror image! <Bob>Yes. Now consider the treatment that addresses the root cause and that cures the patient. What happens then? <Leslie>We use the diagnosis is used to create a treatment Plan for the specific patient; we then Do that, and we Study the effect of the treatment in that specific patient, using our various charts to compare what actually happens with what we predicted would happen. Then we decide what to do next: the final action. We may stop because we have achieved our goal, or repeat the whole cycle to achieve further improvement. So that is our old friend P-D-S-A. <Bob>Yes. And what links the two bits together … what is the bit in the middle? <Leslie>Once we have a diagnosis we look up the appropriate treatment options that have been proven to work through research trials and experience; and we tailor the treatment to the specific patient. Oh I see! The missing link is design. We design a specific treatment plan using generic principles. <Leslie>So I need to teach this backwards: P-D-S-A and then Design and then A-S-P-D! <Bob>Yup – and you know that by another name. <Leslie> 6M Design®! That is what my Improvement Science Practitioner course is all about. <Leslie> If you had told me that at the start it would not have made much sense – it would just have confused me. <Bob>I know. That is the reason I did not. The Mirror needs to be discovered in order for the true value to appreciated. At the start we look in the mirror and perceive what we want to see. We have to learn to see what is actually there. Us. Now you can see clearly where P-D-S-A and Design fit together and the missing A-S-D-P component that is needed to assemble a 6M Design® engine. That is Improvement-by-Design in a nine-letter nutshell. <Leslie> Wow! I can’t wait to share this. <Bob> And what do you expect the response to be? <Bob> From the die hard skeptics – yes. It is the ones who do not say “Yes, but” that you want to engage with. The ones who are quiet. It is always the quiet ones that hold the key. One of the best things about improvement is the delight that we feel when someone else acknowledges it. Particularly someone whose opinion we respect. We need this affirmative feedback to fuel our improvement engine. And we need to learn how to give ourselves affirmative feedback because usually there is a LOT of improvement work to do behind the scenes before any externally visible improvement appears. It is like an iceberg – most of it is hidden from view. And improvement is tough. We have to wade through Bureaucracy Treacle that is laced with Cynicide and policed by Skeptics. We know this. So we need to learn to celebrate the milestones we achieve and to keep reminding ourselves of what we have already done. Even if no one else notices or cares. Like the certificates, cups, and medals that we earned at school – still proudly displayed on our mantlepieces and shelves decades later. They are important. Especially to us. So it is always a joy to celebrate the achievement of others and to say “Well Done” for reaching a significant milestone on the path of learning Improvement Science. And that has been my great pleasure this week – to prepare and send the Certificates of Achievement to those who have recently completed the FISH course. The best part of all has been to hear how many times the word “treasured” is used in the “Thank You” replies. We display our Certificates with pride – not so much that others can see – more to remind ourselves every day to Celebrate Achievement. It is almost autumn again. The new school year brings anticipation and excitement. The evenings are drawing in and there is a refreshing chill in the early morning air. This is the time of year for fudge. Alas not the yummy sweet sort that Grandma cooked up and gave out as treats. In healthcare we are already preparing the Winter Fudge – the annual guessing game of attempting to survive the Winter Pressures. By fudging the issues. This year with three landmark Safety and Quality reports under our belts we have more at stake than ever … yet we seem as ill prepared as usual. Mr Francis, Prof Keogh and Dr Berwick have collectively exhorted us to pull up our socks. So let us explore how and why we resort to fudging the issues. Watch the animation of a highly simplified emergency department and follow the thoughts of the manager. You can pause, rewind, and replay as much as you like. Follow the apparently flawless logic – it is very compelling. The exercise is deliberately simplified to eliminate wriggle room. But it is valid because the behaviour is defined by the Laws of Physics – and they are not negotiable. The problem was combination of several planning flaws – two in particular. First is the “Flaw of Averages” which is where the past performance-over-time is boiled down to one number. An average. And that is then used to predict precise future behaviour. This is a very big mistake. The second is the “Flaw of Fudge Factors” which is a attempt to mitigate the effects of first error by fudging the answer – by adding an arbitrary “safety margin”. This pseudo-scientific sleight-of-hand may polish the planning rhetoric and render it more plausible to an unsuspecting Board – but it does not fool Reality. In reality the flawed design failed – as the animation dramatically demonstrated. The simulated patients came to harm. Unintended harm to be sure – but harm nevertheless. The alternative is to learn how to avoid Sir Flaw of Averages and his slippery friend Mr Fudge Factor. And learning how to do that is possible … it is called Improvement Science. And you can start right now … click HERE. Posted in 6M Design, Design, Examples, FISH, Improvementology, Reflections, Stories, Training | Comments Off on Fudge? We Love Fudge! The mind is a labyrinth of knowledge – a maze with many twists, turns, joins, splits, tunnels, bridges, crevasses and caverns. Some paths lead to dead ends; others take a long way around but get to the destination in the end. The shortest path is not obvious – even in hindsight. 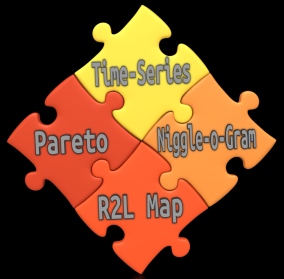 And there is another challenge … no two individuals share the same knowledge labyrinth. An obvious path between problem and solution for one person may be invisible or incomprehensible to another. But the greatest challenge, and the greatest opportunity, is that our labyrinth of knowledge can change and does change continuously … through learning. So if one person can see a path of improvement between current problem and future solution, then how can they guide another who cannot? This is a challenge that an Improvement Scientist faces every day. It is not effective to just give a list of instructions – “To get from problem to solution follow this path“. The path may not exist in the recipients knowledge labyrinth. If they just follow the instructions they will come up against a wall or fall into a hole. It is not realistic to expect the learner to replace their labyrinth of knowledge with that of the teacher – to clone the teachers way of thinking. Just reciting the Words of the Guru is not improvement – is Zealotry. One way is for a guide to describe their own labyrinth of knowledge. To lay it out in a way that any other can explore. A way that is fully signposted, with explanations and maps that that the explorer can refer to as they go. A template against which they can compare their own knowledge labyrinth to reveal the similarities and the differences. No two people will explore a knowledge labyrinth in the same way … but that does not matter. So long as they are able to uncover and assumptions that misguide them and any gaps in their knowledge block their progress. With that feedback they can update their own mental signposts and create safe, effective and efficient paths that they can follow in future at will. And that is how the online FISH training is designed. 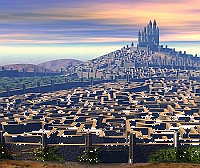 It is the knowledge labyrinth of an experienced Improvement Scientist that can be explored online. Improvement Science is a collaborative community activity. And word about what is possible spreads through The Grape Vine. 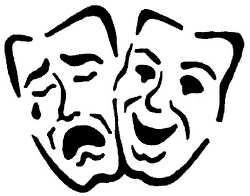 And it spreads in a particular way – through stories – personal accounts of “ah ha” moments. Those “ah ha” moments are generated by a process – a process designed to generate them. And that process is called the Nerve Curve. It is rather like an emotional roller-coaster ride. The Nerve Curve starts comfortably enough with a few gentle ups, downs, twists and turns – just to settle everyone in their seats. Then it picks up pace and you have to hold on a bit tighter. Then comes the Challenge – an interactive group-led improvement activity. Something like the “Save the NHS Game“. Then comes the Shock! When the “intuitively obvious” and “collectively agreed” decisions and actions make the problem worse rather than better. The shock is magnified by learning that there is a solution – and that it was hidden from us. We did not know what we did not know. We were blissfully ignorant. Now we are not. We are painfully aware of what we did not know. Then we head for Denial like a scared rabbit – but the cars are moving fast now and the is no stopping or going back. We cannot get off – we cannot go back – so we cover our eyes and ears to block out the New Reality. It does not work very well. We quickly realize that it is safer to be able to see where we are heading so we can prepare for what is coming. An emotional brick wall looms up in front of us – and written on it are the words “Impossibility Hypothesis”. And we are heading right at it. A new emotion bubbles to the surface. That does not work very well either. So we try a different strategy. We desperately want to limit the damage to comfort zone and confidence so we try negotiating a compromise, finding an exit option, and looking for the emergency stop cord. There isn’t one. Reality is relentless and ruthless. Uncompromising. Now we are really scared and with no viable options for staying where we were and no credible options for avoiding a catastrophe we are emotionally stuck – and we start to sink into Depression which is the path to Hopelessness, Apathy and Despair (HAD). We have run out of options. And we cannot stay in the past. But the seed of innovation has been sown. A hidden problem has been uncovered and an unknown option has been demonstrated. The “Way Over The Impossible-for-Me barrier” is clearly signposted. The light at the end of the tunnel has been switched on. We have a choice. And at the last second we sweep over the Can’t Do Barrier and when we look back it has disappeared – it was a mirage – a perceptual trick our Intuition was playing on us. It only existed in our minds. That is the “Ah ha”. And now we can see a way forward – and how with support, guidance, encouragement and effort we can climb up Acceptance Mountain to Resolution Peak. It is will not be quick. It will not be comfortable. We have some unlearning to do. A few old assumptions and habits that need to be challenged, dismantled and re-designed. It is hard work but it is surprisingly invigorating as a previously unrecognized inner well of hope, enthusiasm and confidence is tapped. We surprise ourselves with what we can do already. We realize that the only thing that was actually blocking us before was our belief it was too difficult. And the lack of a guide. And then we share our “ah ha” with others through The Grape Vine. The Post It® Note exercise was my biggest “Aha” moment on a combination of levels. The aspect that particularly resonated was the range of behaviours and responses from the different pairings, an aspect that would have been hidden had I done the exercise on my own. I’m still smiling at the simple elegance of this particular exercise and the depth of learning I am getting from it. [PD, Consultant Paediatrician. 15th July 2013]. This blog is part of The Grape Vine. The Nerve Curve is ready and waiting to take you on an exciting ride through Improvement Science! Improvement-by-Design is not the same as Improvement-by-Desire. Improvement-by-Design has a clear destination and a design that we know can get us there because we have tested it before we implement it. Improvement-by-Desire has a vague direction and no design – we do not know if the path we choose will take us in the direction we desire to go. We cannot see the twists and turns, the unknown decisions, the forks, the loops, and the dead-ends. We expect to discover those along the way. It is an exercise in hope. 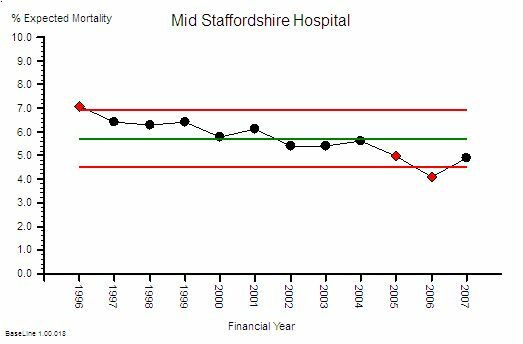 So where pessimists and skeptics dominate the debate then Improvement-by-Design is a safer strategy. Just over seven weeks ago I started an Improvement-by-Design project – a personal one. 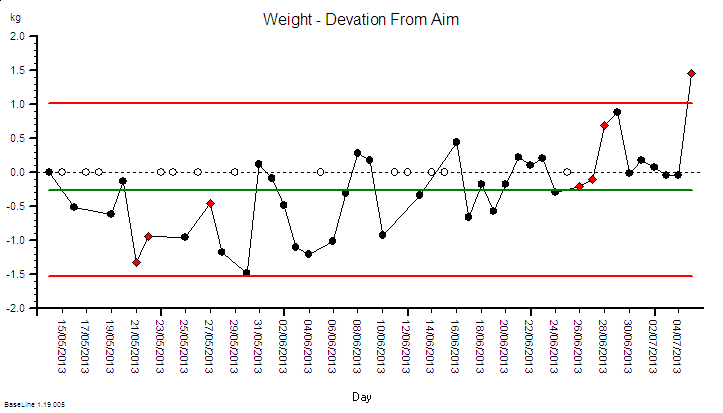 The destination was clear: to get my BMI (body mass index) into a “healthy” range by reducing weight by about 5 kg. The design was clear too – to reduce energy input rather than increase energy output. It is a tried-and-tested method – “avoid burning the toast”. The physical and physiological model predicted that the goal was achievable in 6 to 8 weeks. To answer that question requires two time-series charts. 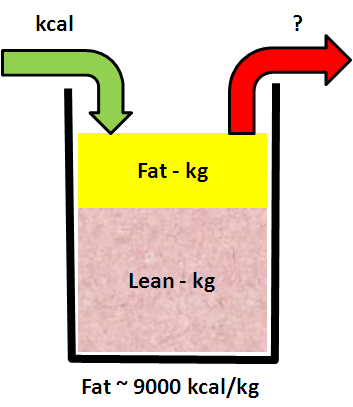 The input chart of calories ingested and the output chart of weight. This is Step 5 of the 6M Design® sequence. Remember that there was another parameter in this personal Energy-Weight system: the daily energy expended. But that is very difficult to measure accurately – so I could not do that. What I could do was to estimate the actual energy expended from the model of the system using the measured effect of the change. But that is straying into the Department of Improvement Science Nerds. Let us stay in the real world a bit longer. It shows an average calorie intake of 1500 kcal – the estimated required value to achieve the weight loss given the assumptions of the physiological model. It also shows a wide day-to-day variation. It does not show any signal flags (red dots) so an inexperienced Improvementologist might conclude that this just random noise. It is not. The data is not homogeneous. There is a signal in the system – a deliberate design change – and without that context it is impossible to correctly interpret the chart. Remember Rule #1: Data without context is meaningless. The deliberate process design change was to reduce calorie intake for just two days per week by omitting unnecessary Hi-Cal treats – like those nice-but-naughty Chocolate Hobnobs. 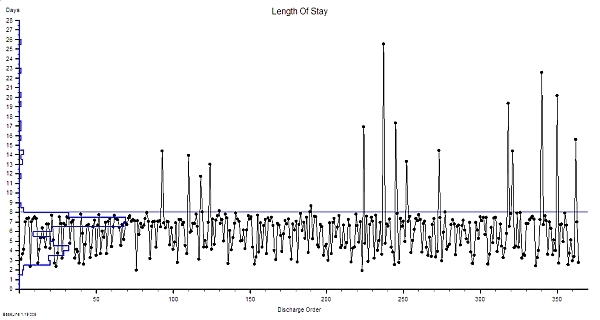 But which two days varied – so there is no obvious repeating pattern in the chart. And the intake on all days varied – there were a few meals out and some BBQ action. 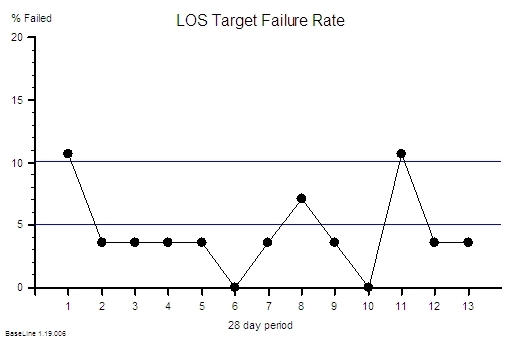 To separate out these two parts of the voice-of-the-process we need to rationally group the data into the Lo-cal days (F) and the OK-cal days (N). The grouped BaseLine© chart tells a different story. The two groups clearly have a different average and both have a lower variation-over-time than the meaningless mixed-up chart. And we can now see a flag – on the second F day. That is a prompt for an “investigation” which revealed: will-power failure. Thursday evening beer and peanuts! The counter measure was to avoid Lo-cal on a Thursday! What we are seeing here is the fifth step of 6M Design® exercise – the Monitor step. And as well as monitoring the factor we are changing – the cause; we also monitor the factor we want to influence – the effect. The effect here is weight. And our design includes a way of monitoring that – the daily weighing. 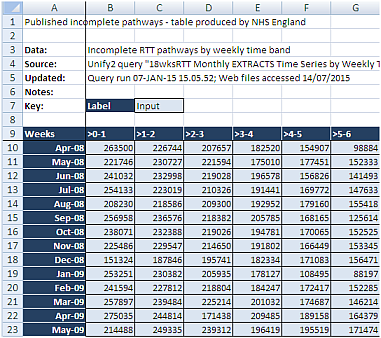 The output metric BaseLine© chart – weight – shows a very different pattern. It is described as “unstable” because there are clusters of flags (red dots) – some at the start and some at the end. The direction of the instability is “falling” – which is the intended outcome. So we have robust, statistically valid evidence that our modified design is working. The weight is falling so the energy going in must be less than the energy being put out. I am burning off the excess lard and without doing any extra exercise. The physics of the system mandate that this is the only explanation. And that was my design specification. So that is good. Our design is working – but is it working as we designed? Does observation match prediction? This is Improvement-by-Design. 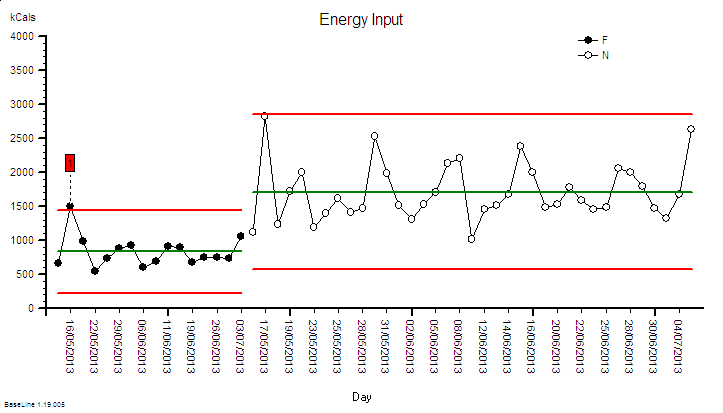 Remember that we had to estimate the other parameter to our model – the average daily energy output – and we guessed a value of 2400 kcal per day using generic published data. Now I can refine the model using my specific measured change in weight – and I can work backwards to calculate the third parameter. And when I did that the number came out at 2300 kcal per day. Not a huge difference – the equivalent of one yummy Chocolate Hobnob a day – but the effect is cumulative. 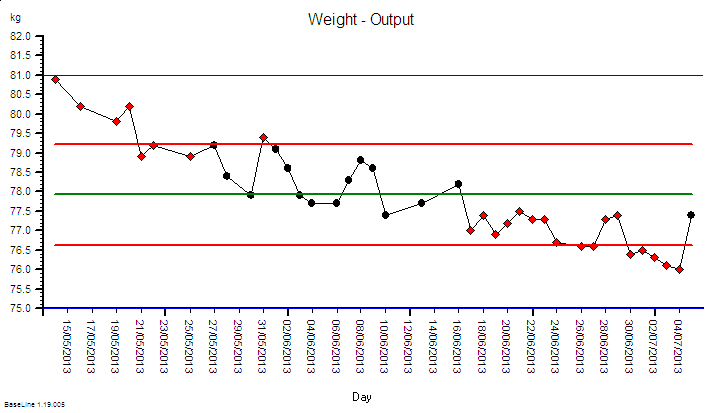 Over the 53 days of the 6M Design® project so far that would be a 5300 kcal difference – about 0.6kg of useless blubber. 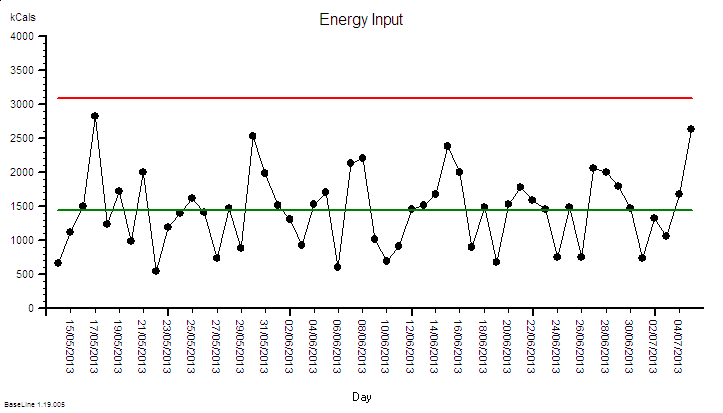 So now I have refined my personal energy-weight model using the new data and I can update my prediction and create a new chart – a Deviation from Aim chart. This is the chart I need to watch to see if I am on the predicted track – and it too is unstable -and not a good direction. It shows that the deviation-from-aim is increasing over time and this is because my original guesstimate of an unmeasurable model parameter was too high. This means that my current design will not get me to where I want to be, when I what to be there. This tells me I need to tweak my design. And I have a list of options. 4) I could do a bit of any or all three. And because I am comparing experience with expectation using a DFA chart I will know very quickly if the design tweak is delivering. And because some nice weather has finally arrived so the BBQ will be busy I have chosen to take longer to get there. I will enjoy the weather, have a few beers and some burgers. And that is OK. It is a perfectly reasonable design option – it is a rational and justifiable choice. And I need to set my next destination – a weight if about 72 kg according to the BMI chart – and with my calibrated Energy-Weight model I will know exactly how to achieve that weight and how long it will take me. And I also know how to maintain it – by increasing my calorie intake. More beer and peanuts – maybe – or the occasional Chocolate Hobnob even. Hurrah! Win-win-win! This real-life example illustrates 6M Design® in action and demonstrates that it is a generic framework. The energy-weight model in this case is a very simple one that can be worked out on the back of a beer mat (which is what I did). It is called a linear model because the relationship between calories-in and weight-out is approximately a straight line. Most real-world systems are not like this. Inputs are not linearly related to outputs. They are called non-linear systems: and that makes a BIG difference. A very common error is to impose a “linear model” on a “non-linear system” and it is a recipe for disappointment and disaster. We do that when we commit the Flaw of Averages error. We do it when we plot linear regression lines through time-series data. We do it when we extrapolate beyond the limits of our evidence. We do it when we equate time with money. The danger of this error is that our linear model leads us to make unwise decisions and we actually make the problem worse – not better. We then give up in frustration and label the problem as “impossible” or “wicked” or get sucked into to various forms of Snake Oil Sorcery. The safer approach is to assume the system is non-linear and just let the voice of the system talk to us through our BaseLine© charts. The challenge for us is to learn to understand what the system is saying. 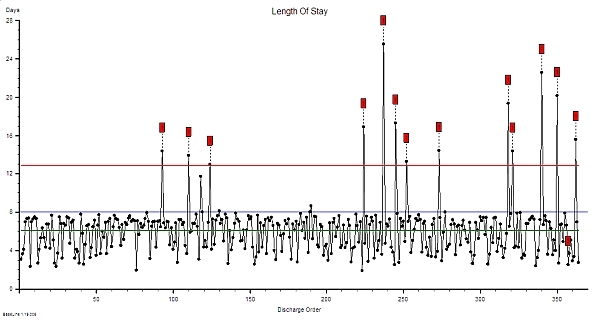 That is why the time-series charts are called System Behaviour Charts and that is why they are an essential component of Improvement-by-Design. However – there is a step that must happen before this – and that is to get the Foundations in place. The foundation of knowledge on which we can build our new learning. That gap must be filled first. And anyone who wants to invest in learning the foundations of improvement science can now do so at their own convenience and at their own pace because it is on-line …. and it is here. Improvement Science is not a new idea. The principles are enduring and can be traced back as far as recorded memory – for Millennia. This means that there is a deep well of ancient wisdom that we can draw from. Much of this wisdom is condensed into short sayings which capture a fundamental principle or essence. This captures the essence of a paradigm shift – a term made popular by Thomas S Kuhn in his seminal 1962 book – The Structure of Scientific Revolutions. It was written just over 50 years ago. System-wide change takes time and the first stage is the gradual build up of dissatisfaction with the current paradigm. The usual reaction from the Guardians of the Status Quo is to silence the first voices of dissent, often brutally. As the pressure grows there are too many voices to silence individually so more repressive Policies and Policing are introduced. This works for a while but does not dissolve the drivers of dissatisfaction. The pressure builds and the cracks start to appear. This is a dangerous phase. There are three ways out: repression, revolution, and evolution. The last one is the preferred option – and it requires effective leadership to achieve. Effective leaders are both Teachers and Students. Knowledge and understanding flow through them as they acquire Wisdom. The first essence of the message is that the solutions to the problems are already known – but the reason they are not widely known and used is our natural affection for the familiar and our distrust of the unfamiliar. If we are comfortable then why change? It is only when we are uncomfortable enough that we will start to look for ways to regain comfort – physical and psychological. The second essence of the message is that to change we need to learn something and that means we have to become Students, and to seek the guidance of a Teacher. Someone who understands the problems, their root causes, the solutions, the benefits and most importantly – how to disseminate that knowledge and understanding. A Teacher that can show us how not just tell us what. The third essence of the message is that the Students become Teachers themselves as they put into practice what they have learned and prove to themselves that it works, and it is workable. The new understanding flows along the Optimism-Skepticism gradient until the Tipping Point is reached. It is then unstoppable and the Paradigm flips. Often remarkably quickly. The risk is that change means opportunity and there are many who can sniff out an opportunity to cash in on the change chaos. They are the purveyors of Snakeoil – and they prey on the dissatisfied and desperate. So how does a Student know a True-Teacher from a Snakeoil Salesperson? Simple – the genuine Teacher will be able to show a portfolio of successes and delighted ex-students; will be able to explain and demonstrate how they were both achieved; will be willing to share their knowledge; and will respectfully decline to teach someone who they feel is not yet ready to learn. Tangible improvement takes time. Sometimes it takes a long time. The more fundamental the improvement the more people are affected. The more people involved the greater the psychological inertia. The greater the resistance the longer it takes to show tangible effects. The advantage of deep-level improvement is that the cumulative benefit is greater – the risk is that the impatient Improvementologist may give up too early – sometimes just before the benefit becomes obvious to all. The seeds of change need time to germinate and to grow – and not all good ideas will germinate. The green shoots of innovation do not emerge immediately – there is often a long lag and little tangible evidence for a long time. This inevitable delay is a source of frustration, and the impatient innovator can unwittingly undo their good work. By pushing too hard they can drag a failure from the jaws of success. Q: So how do we avoid this trap? The trick is to understand the effect of the change on the system. This means knowing where it falls on our Influence Map that is marked with the Circles of Control, Influence and Concern. Our Circle of Concern includes all those things that we are aware of that present a threat to our future survival – such as a chunk of high-velocity space rock smashing into the Earth and wiping us all out in a matter of milliseconds. Gulp! Very unlikely but not impossible. Some concerns are less dramatic – such as global warming – and collectively we may have more influence over changing that. But not individually. Our Circle of Influence lies between the limit of our individual control and the limit of our collective control. This a broad scope because “collective” can mean two, twenty, two hundred, two thousand, two million, two billion and so on. Making significant improvements is usually a Circle of Influence challenge and only collectively can we make a difference. But to deliver improvement at this level we have to influence others to change their knowledge, understanding, attitudes, beliefs and behaviour. That is not easy and that is not quick. It is possible though – with passion, plausibility, persistence, patience – and an effective process. It is here that we can become impatient and frustrated and are at risk of giving up too soon – and our temperaments influence the risk. Idealists are impatient for fundamental change. Rationals, Guardians and Artisans do not feel the same pain – and it is a rich source of conflict. So if we need to see tangible results quickly then we have to focus closer to home. We have to work inside our Circle of Individual Influence and inside our Circle of Control. The scope of individual influence varies from person-to-person but our Circle of Control is the same for all of us: the outer limit is our skin. We all choose our behaviour and it is that which influences others: for better or for worse. It is not what we think it is what we do. We cannot read or control each others minds. We can all choose our attitudes and our actions. So if we want to see tangible improvement quickly then we must limit the scope of our action to our Circle of Individual Influence and get started. We do what we can and as soon as we can. Choosing what to do and what not do requires wisdom. That takes time to develop too. Making an impact outside the limit of our Circle of Individual Influence is more difficult because it requires influencing many other people. So it is especially rewarding for to see examples of how individual passion, persistence and patience have led to profound collective improvement. It proves that it is still possible. It provides inspiration and encouragement for others. 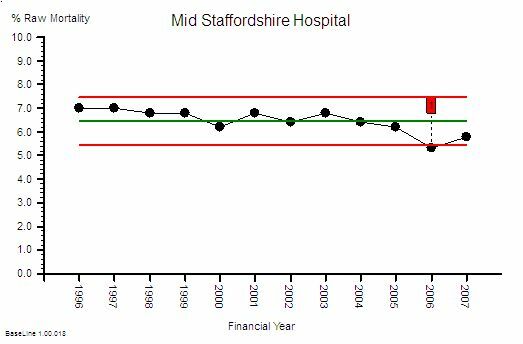 One example is the recently published Health Foundation Quality, Cost and Flow Report. 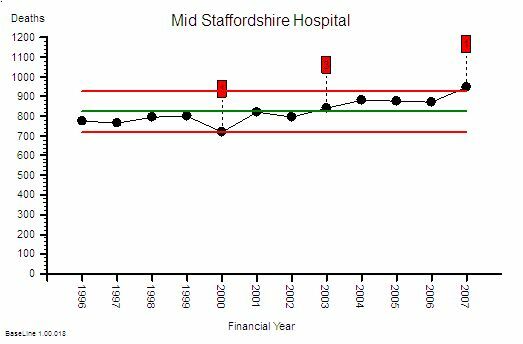 This was a three-year experiment to test if the theory, techniques and tools of Improvement Science work in healthcare: specifically in two large UK acute hospitals – Sheffield and Warwick. The results showed that Improvement Science does indeed work in healthcare and it worked for tough problems that were believed to be very difficult if not impossible to solve. That is very good news for everyone – patients and practitioners. 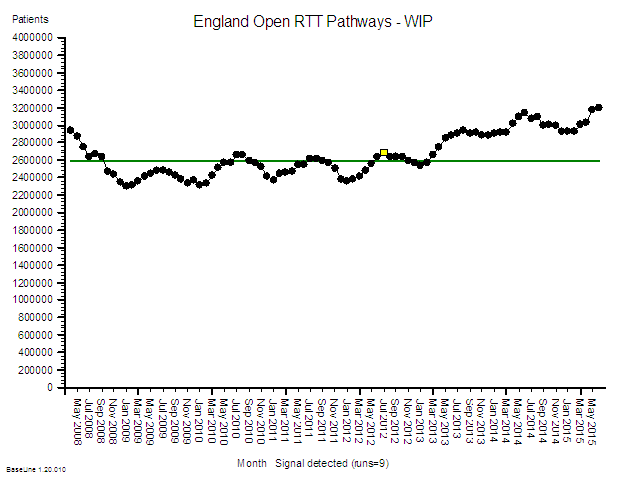 But the results have taken some time to appear in published form – so it is really good news to report that the green shoots of improvement are now there for all to see. 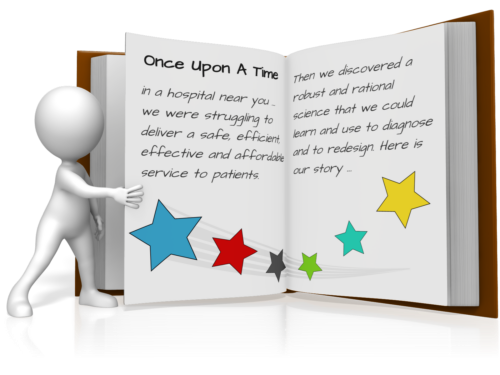 The case studies provide hard evidence that win-win-win outcomes are possible and achievable in the NHS. The Impossibility Hypothesis has been disproved. The cynics can step off the bus. The skeptics have their evidence and can now become adopters. These references both describe the fundamentals of how to align financial improvement with quality and delivery improvement to achieve the elusive win-win-win outcome. A previously invisible door has opened to reveal a new Land of Opportunity. A land inhabited by Improvementologists who mark the path to learning and applying this new knowledge and understanding. There are many who do not know what to do to solve the current crisis in healthcare – they now have a new vista to explore. Do not give up too soon – there is a light at the end of the dark tunnel. 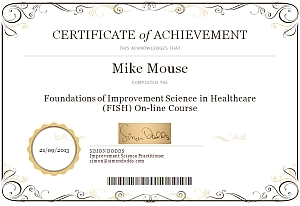 And to get there safely and quickly we just need to learn and apply the Foundations of Improvement Science in Healthcare – and we first learn to FISH in our own ponds first. The sound heralded the arrival of a tweet so Bob looked up from his book and scanned the message. It was from Leslie, one of the Improvement Science apprentices. There was laughing on the other end of the line – it was Leslie. <Leslie> Ho Ho. Hi Bob – I thought that might prick your curiosity if you were on line. I know you like novel words. <Bob> Ah! You know my weakness – I am at your mercy now! So, I am consumed with curiosity – as you knew I would be. <Leslie> Well, I have discovered a source of antagonism that creates a lot of cultural imbalance and emotional heat in my organisation. <Bob> OK. So I take from that you mean an imbalance in the People part that then upsets the Process and System parts. <Leslie> Yes, exactly. 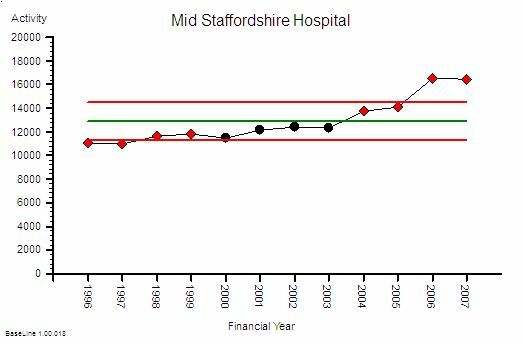 In your Improvement Science course you mentioned the theory behind this but did not share any real examples. <Bob> That is very possible. Hard evidence and explainable examples are easier for the Process component – the People stuff is more difficult to do that way. Can you be more specific? I think I know where you may be going with this. <Leslie> OK. Where do you feel I am going with it? <Bob> Ha! The student becomes the teacher. Excellent response! I was thinking something to do with the Four Temperaments. <Leslie>Yes. And specifically the conflict that can happen between them. I am thinking of the tension between the Idealists and the Guardians. <Bob> Ah! Yes. The Bile Wars – Yellow and Black. The Cholerics versus the Melancholics. So do you have hard evidence of this happening in reality rather than just my theoretical rhetoric? <Leslie> Yes! But the facts do not seem to fit the theory. You know that I work in a hospital. Well one of the most important “engines” of a hospital is the surgical operating suite. Conveniently called the SOS. <Bob> Yes. It seems to be a frequent source of both Nuggets and Niggles. <Leslie> Well, I am working with the SOS team at my hospital and I have to say that they are a pretty sceptical bunch. Everyone seems to have strong opinions. Strong but different opinions of what should happen and who should do it. The words someone and should get mentioned a lot. I have not managed to find this elusive “someone” yet. The some-one, no-one, every-one, any-one problem. <Bob> OK. I have heard this before. I hear that surgeons in particular have strong opinions – and they disagree with each other! I remember watching episodes of “Doctor in the House” many years ago. What was the name of the irascible chief surgeon played by James Robertson Justice? Sir Lancelot Spratt The archetype surgeon. Are they actually like that? <Leslie> I have not met any as extreme as Sir Lancelot though some do seem to emulate that role model. 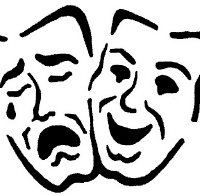 In reality the surgeons, anaesthetists, nurses, ODPs, and managers all seem to believe there is one way that a theatre should be run, their way, and their separate “one ways” do not line up. Hence the high emotional temperature. <Bob> OK, so how does the Temperament dimension relate to this? Is there a temperament mismatch between the different tribes in the operating suite as the MBTI theory would suggest? <Leslie> That was my hypothesis and I decided that the only way I could test it was by mapping the temperaments using the Temperament Sorter from the FISH toolbox. <Bob> Excellent, but you would need quite a big sample to draw any statistically valid conclusions. How did you achieve that with a group of disparate sceptics? <Leslie>I know. So I posed this challenge as a research question – and they were curious enough to give it a try. Well, the Surgeons and Anaesthetists were anyway. The Nurses, OPDs and Managers chose to sit on the fence and watch the game. <Bob>Wow! Now I am really interested. What did you find? <Leslie>Woah there! I need to explain how we did it first. They have a monthly audit meeting where they all get together as separate groups and after I posed the question they decided to do use the Temperament Sorter at one of those meetings. It was done in a light-hearted way and it was really good fun too. I brought some cartoons and descriptions of the sixteen MBTI types and they tried to guess who was which type. <Bob>Excellent. So what did you find? <Leslie>We disproved the hypothesis that there was a Temperament mismatch. <Bob>Really! What did the data show? <Leslie>… and that there was no statistical difference between surgeons and anaesthetists. <Bob>Really! So what are they both? <Leslie>Guardians. The majority of both tribes are SJs. There was a long pause. Bob was digesting this juicy new fact. Leslie knew that if there was one thing that Bob really liked it was having a theory disproved by reality. Eventually he replied. <Bob> Clarity of hindsight is a wonderful thing. It makes complete sense that they are Guardians. Speaking as a patient, what I want most is Safety and Predictability which is the ideal context for Guardians to deliver their best. I am sure that neither surgeons nor anaesthetists like “surprises” and I suspect that they both prefer doing things “by the book”. They are sceptical of new ideas by temperament. <Leslie> And there is more. <Leslie> They are tough-minded Guardians. They are STJs. <Bob> Of course! Having the responsibility of “your life in my hands” requires a degree of tough-mindedness and an ability to not get too emotionally hooked. Sir Lancelot is a classic extrovert tough-minded Guardian! The Rolls-Royce and the ritual humiliation of ignorant underlings all fits. Wow! Well done Leslie. So what have you done with this new knowledge and deeper understanding? <Leslie>Ouch! You got me! That is why I sent the Tweet. Now what do I do? <Bob>Ah! I am not sure. We are both in uncharted water now so I suggest we explore and learn together. Let me ponder and do some exploring of the implications of your findings and I will get back to you. Can you do the same? <Leslie>Good plan. Shall we share notes in a couple of days? <Bob>Excellent. I look forward to it. This is not a completely fictional narrative. In a recent experiment the Temperament of a group of 66 surgeons and 65 anaesthetists was mapped using a standard Myers-Briggs Type Indicator® tool. The data showed that the proportion reporting a Guardian (xSxJ) preference was 62% for the surgeons and 59% for the anaesthetists. The difference was not statistically significant [For the statistically knowledgable the Chi-squared test gave a p-value of 0.84]. The reported proportion of the normal population who have a Guardian temperament is 34% so this is very different from the combined group of operating theatre doctors [Chi-squared test, p<0.0001]. Digging deeper into the data the proportion showing the tough-minded Guardian preference, the xSTJ, was 55% for the Surgeons and 46% for the Anaesthetists whichwas also not significantly different [p=0.34] but compared with a normal population proportion of 24% there are significantly more tough-minded Guardians in the operating theatre [p<0.0001]. So what then is the difference between Surgeons and Anaesthetists in their preferred modes of thinking? The data shows that Surgeons are more likely to prefer Extraversion – the ESTJ profile – compared with Anaesthetists – who lean more towards Introversion – the ISTJ profile (p=0.12). This p-value means that with the data available there is a one in eight chance that this difference is due to chance. We would needs a bigger set of data to get greater certainty. The temperament gradient is enough to create a certain degree of tension because although the Guardian temperament is the same, and the tough-mindedness is the same, the dominant function differs between the ESTJ and the ISTJ types. As the Surgeons tend to the ESTJ mode, their dominant function is Thinking Judgement. The Anaesthetists tend to perfer ISTJ so their dominant fuction is Sensed Perceiving. This makes a difference. And it fits with their chosen roles in the operating theatre. The archetype ESTJ Surgeon is the Supervisor and decides what to do and who does it. The archetype ISTJ Anaesthetist is the Inspector and monitors and maintains safety and stability. This is a sweepig generalisation of course – but a useful one. The roles are complementary, the minor conflict is inevitable, and the tension is not a “bad” thing – it is healthy – for the patient. But when external forces threaten the safety, predictability and stability the conflict is amplified. Hot wet air looks clear. Cold dry air looks clear too. When hot-humid air from the tropics meets cold-crisp air from the poles then a band of of fog will be created. We call it a weather front and it generates variation. And if the temperature and humidity difference is excessive then storm clouds will form. The lightning will flash and the thunder will growl as the energy is released. Clouds obscure clarity of forward vision but clouds also create shade from the sun above; clouds trap warmth beneath; and clouds create rain which is necessary to sustain growth. Clouds are not all bad. An Improvement Scientist knows that 100% harmony is not the healthiest ratio. Unchallenged group-think is potentially dangerous. Zero harmony is also unhealthy. Open warfare is destructive. Everyone loses. A mixture of temperaments, a bit of fog, and a bit of respectful challenge is healthier than All or None. It is at the chaotic interface between different temperaments that learning and innovation happens so a slight temperamenture gradient is ideal. The emotometer should not read too cold or too hot. Understanding this is a big step towards being able to manage the creative tension. To explore the Temperamenture Map of your team, department and organisation try the Temperament Sorter tool – one of the Improvement Science cultural diagnostic tests. Posted in Examples, FISH, Governance, Healthcare, Quality, Reflections, Techniques, Theory, Tools | Comments Off on What is the Temperamenture? 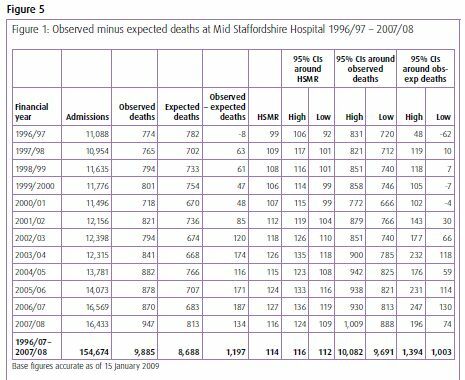 The Robert Francis QC Report and recommendations from the Mid-Staffordshire Hospital Crisis has been published – and it is a sobering read. The emotions that just the executive summary evoked in me were sadness, shame and anger. Sadness for the patients, relatives, and staff who have been irreversibly damaged; shame that the clinical professionals turned a blind-eye; and anger that the root cause has still not been exposed to public scrutiny. Click here to get a copy of the RFQC Report Executive Summary. Click here to see the video of RFQC describing his findings. The root cause is ignorance at all levels of the NHS. Not stupidity. Not malevolence. Just ignorance. Ignorance of what is possible and ignorance of how to achieve it. RFQC rightly focusses his recommendations on putting patients at the centre of healthcare and on making those paid to deliver care accountable for the outcomes. Disappointingly, the report is notably thin on the financial dimension other than saying that financial targets took priority over safety and quality. He is correct. They did. But the report does not say that this is unnecessary – it just says “in future put safety before finance” and in so doing he does not challenge the belief that we are playing a zero-sum-game. The assumotion that higher-quality-always-costs-more. This assumption is wrong and can easily be disproved. A system that has been designed to deliver safety-and-quality-on-time-first-time-and-every-time costs less. And it costs less because the cost of errors, checking, rework, queues, investigation, compensation, inspectors, correctors, fixers, chasers, and all the other expensive-high-level-hot-air-generation-machinery that overburdens the NHS and that RFQC has pointed squarely at is unnecessary. He says “simplify” which is a step in the right direction. The goal is to render it irrelevent. The ignorance is ignorance of how to design a healthcare system that works right-first-time. The fact that the Francis Report even exists and is pointing its uncomfortable fingers-of-evidence at every level of the NHS from ward to government is tangible proof of this collective ignorance of system design. And the good news is that this collective ignorance is also unnecessary … because the knowledge of how to design safe-and-affordable systems already exists. We just have to learn how. I call it 6M Design® – but the label is irrelevent – the knowledge exists and the evidence that it works exists. 1.131 Compliance with the fundamental standards should be policed by reference to developing the CQC’s outcomes into a specification of indicators and metrics by which it intends to monitor compliance. These indicators should, where possible, be produced by the National Institute for Health and Clinical Excellence (NICE) in the form of evidence-based procedures and practice which provide a practical means of compliance and of measuring compliance with fundamental standards. This is the safety-and-quality outcome specification for a healthcare system design – the required outcome presented as a relevent metric in time-series format and qualified by context. Only a stable outcome can be compared with a reference standard to assess the system capability. An unstable outcome metric requires inquiry to understand the root cause and an appropriate action to restore stability. A stable but incapable outcome performance requires redesign to achieve both stability and capability. And if the terms used above are unfamiliar then that is further evidence of system-design-ignorance. 1.132 The procedures and metrics produced by NICE should include evidence-based tools for establishing the staffing needs of each service. These measures need to be readily understood and accepted by the public and healthcare professionals. This is the capacity-and-cost specification of any healthcare system design – the financial envelope within which the system must operate. The system capacity design works backwards from this constraint in the manner of “We have this much resource – what design of our system is capable of delivering the required safety and quality outcome with this capacity?” The essence of this challenge is to identify the components of poor (i.e. wasteful) design in the existing systems and remove or replace them with less wasteful designs that achieve the same or better quality outcomes. This is not impossible but it does require system diagnostic and design capability. If the NHS had enough of those skills then the Francis Report would not exist. 1.133 Adoption of these practices, or at least their equivalent, is likely to help ensure patients’ safety. Where NICE is unable to produce relevant procedures, metrics or guidance, assistance could be sought and commissioned from the Royal Colleges or other third-party organisations, as felt appropriate by the CQC, in establishing these procedures and practices to assist compliance with the fundamental standards. How to implement evidence-based research in the messy real world is the Elephant in the Room. It is possible but it requires techniques and tools that fall outside the traditional research and audit framework – or rather that sit between research and audit. This is where Improvement Science sits. The fact that the Report only mentions evidence-based practice and audit implies that the NHS is still ignorant of this gap and what fills it – and so it appears is RFQC. 1.136 Information needs to be used effectively by regulators and other stakeholders in the system wherever possible by use of shared databases. Regulators should ensure that they use the valuable information contained in complaints and many other sources. The CQC’s quality risk profile is a valuable tool, but it is not a substitute for active regulatory oversight by inspectors, and is not intended to be. Databases store data. Sharing databases will share data. Data is not information. Information requires data and the context for that data. Furthermore having been informed does not imply either knowledge or understanding. So in addition to sharing information, the capability to convert information-into-decision is also required. And the decisions we want are called “wise decisions” which are those that result in actions and inactions that lead inevitably to the intended outcome. The knowledge of how to do this exists but the NHS seems ignorant of it. So the challenge is one of education not of yet more investigation. 1.137 Inspection should remain the central method for monitoring compliance with fundamental standards. A specialist cadre of hospital inspectors should be established, and consideration needs to be given to collaborative inspections with other agencies and a greater exploitation of peer review techniques. This is audit. This is the sixth stage of a 6M Design® – the Maintain step. Inspectors need to know what they are looking for, the errors of commission and the errors of omission; and to know what those errors imply and what to do to identify and correct the root cause of these errors when discovered. The first cadre of inspectors will need to be fully trained in healthcare systems design and healthcare systems improvement – in short – they need to be Healthcare Improvementologists. And they too will need to be subject to the same framework of accreditation, and accountability as those who work in the system they are inspecting. This will be one of the greatest of the challenges. The fact that the Francis report exists implies that we do not have such a cadre. Who will train, accredit and inspect the inspectors? Who has proven themselves competent in reality (not rhetorically)? 1.163 Responsibility for driving improvement in the quality of service should therefore rest with the commissioners through their commissioning arrangements. Commissioners should promote improvement by requiring compliance with enhanced standards that demand more of the provider than the fundamental standards. This means that commissioners will need to understand what improvement requires and to include that expectation in their commissioning contracts. This challenge is even geater that the creation of a “cadre of inspectors”. What is required is a “generation of competent commissioners” who are also experienced and who have demonstrated competence in healthcare system design. The Commissioners-of-the-Future will need to be experienced healthcare improvementologists. 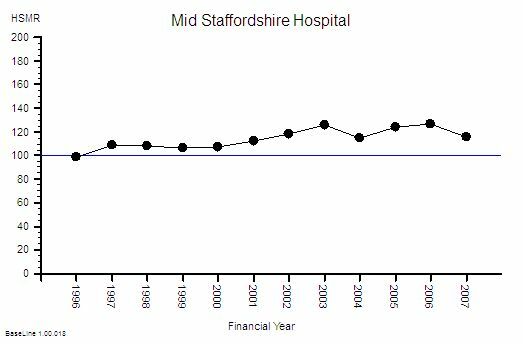 The NHS is sick – very sick. The medicine it needs to restore its health and vitality does exist – and it will not taste very nice – but to withold an effective treatment for an serious illness on that basis is clinical negligence. It is time for the NHS to look in the mirror and take the strong medicine. The effect is quick – it will start to feel better almost immediately. To deliver safety and quality and quickly and affordably is possible – and if you do not believe that then you will need to muster the humility to ask to have the how demonstrated.